Learn to integrate STEM instruction into existing curricula. Put science and math into action through inquiry and the engineering design process. 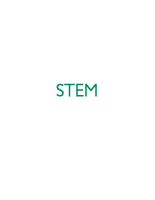 The STEM Institute presents best practices that help students apply mathematical and scientific reasoning. Besides instructional support, Pearson STEM specialists offer comprehensive on-site leadership. Get hands-on support in lesson and assessment development. Learn how to create and install a STEM curriculum and interdisciplinary unit. Focus areas include project- and inquiry-based learning, using technology-supported learning tools, and backwards design. Also focus on the 5E instructional model.